On behalf of WWF Switzerland, Ennovent is managing the Tropical Forest Challenge, which will identify best for-profit solutions having a positive impact on tropical forest biodiversity from around the world. This is the first of two posts focused on for-profit eco-enterprises. A trained accountant, Sanga Moses spent more than three years working in Uganda’s bustling capital city, Kampala. But his life changed in 2009 during a visit to his remote home village in Western Uganda. Moses was on his way out of the village and encountered his 12-year-old sister carrying a large bundle of wood on her head. When he asked her what she was doing, she began crying and explained that she was tired of missing school to gather wood for the family’s cooking needs. And thus began a steep learning curve. Moses admits that as an accountant by training he knew very little about alternative fuel or the full scope of deforestation in Uganda. What he learned was this: more than 3.4 million hectares of Africa’s forests – tropical and beyond – were depleted from 2000 – 2010. A truly dire statistic, Moses was only further motivated to identify possible alternatives to wood fuel. 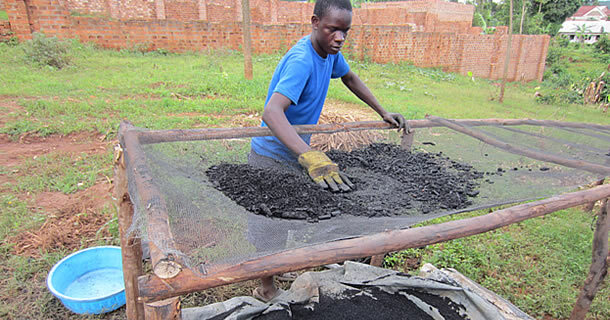 After a year of researching, he discovered that agricultural waste – abundant in rural Uganda – could be turned into clean burning fuel briquettes and fertilizers. A humble man, Moses makes the solution behind his company sound simple – when it’s anything but. 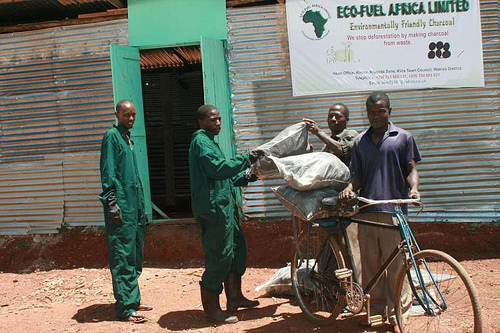 Eco-Fuel Africa invented a low-cost kiln out of oil drums, which are leased to rural farmers to turn their agricultural waste into charcoal powder. The farmers then sell a portion of the power to Eco-Fuel Africa, and retain a portion for themselves as organic fertilizers to increase their yields, and hence, their incomes. Important as this approach may be, it didn’t directly address Moses’s initial motivation for starting the company (or his little sister’s plight). So, Eco-Fuel Africa also created a cost effective no-electricity-required briquetting machine to compress the charcoal powder bought from farmers into clean-burning fuel briquettes. Now with an alternative source of fuel to wood, Eco-Fuel Africa focused on ensuring the clean fuel briquettes were easily accessible to farmers and entrepreneurs. With a strong connection to the rural market, Moses created a network of local women retailers and provided sufficient training so they could become local Eco-Fuel Africa sales “agents.” Now, in addition to bringing the fuel briquettes to market, where they previously earned nothing these women are earning at least USD 5/day to support their families. And this is exactly what Eco-Fuel Africa is doing – providing an alternative option where before there was none. But more than just options, Moses has noticed that education is also a critical part of reducing Uganda’s deforestation. “We are using a part of the proceeds to build schools and educate the locals about the importance of our trees. We’re encouraging them to replant,” he said. There is no doubt that in just a short period of time, Eco-Fuel Africa has begun to have a positive impact on tropical forest preservation. Yet, even with a proven business model under his belt, Moses admits it is difficult to ensure his business can grow and evolve over the long term. He notes there are limited investment flows available to small and medium-sized entrepreneurs across Africa. And because he can mostly be found in the rural communities of Uganda working with the Eco-Fuel Africa team, he has limited access to the Internet to engage in the time-consuming process of raising investment dollars. However, Moses recently applied for the WWF Switzerland Tropical Forest Challenge – a challenge that is working to identify the best for-profit solutions having a positive impact on tropical forest biodiversity in any of the 75 tropical forest-rich countries around the world. The Challenge is an important part of ensuring entrepreneurs like Moses can access capacity building and financing opportunities, in addition to connecting with like-minded entrepreneurs and business experts to help him evolve Eco-Fuel Africa as the model continues to prove high-impact. “I am hoping that I can let others know about what we’re doing, so we can spread the message about issues of deforestation, climate change and Eco-Fuel Africa’s specific solution,” he said. Identifying and supporting these entrepreneurs is, more than ever, a critical mechanism through which we can address pressing social, economic and environmental issues – such as tropical forest degradation – over the long-term. (Moses, picutred left, supplies a network of briquette suppliers). Do you know of entrepreneurs like Moses? Nominate them for the WWF Switzerland Tropical Forest Challenge now. Allison Langille is the Director of Operations at Ennovent.